Sometimes I get an idea in my head and I'm too dumb to know that I'm not supposed to do it. Apparently, sewing with knits is intimidating. I just saw fabric I liked and just did it. Who knew? Today, I decided I was going to make a quilt. I've been wanting to do one for a long time, but have never really had the guts to try it. I have had a zillion other projects and a quilt was never a priority. This time, I had the living room clean, laundry done and dishes done...it was the perfect time to ignore the pantry I was supposed to organize and make something. I didn't start out wanting to make a quilt. I went to the fabric store with the intent of buying the remainder of the cute pink skull fabric. In and out and done. Then, I saw all the pretty colors and that was pretty much it. Some people are distracting by shiny sparkling things...I'm distracted by fabric and paper. Hubby would agree I'm a rather cheap date. Kari (4) is also distracted by fabric and paper. She discovered a quiet book panel and asked me to make her blanket. I tried to explain it was supposed to be a book but she insisted it was a blanket. It was $3 for the panel. I figured, why not? Surely I can make a quilt. It was actually a lot easier than I expected...aside from having no idea how to quilt properly. I had already started sewing the border together when I thought "hmm, I should probably lay this out on the backing to make sure it fits." I rescued a receiving blanket from the goodwill bag that's been sitting in my room for about 3 weeks for the backing. Used up some pink gingham I inherited from freecycle and in about an hour, had the quilt done! And in the eyes of my 4 yo, I'm the most awesomest mommy ever! Wow! What a great little quilt! I have been wanting to try and make one, but I have been too chicken. That is a quilt your daughter is sure to treasure all of her life! Great job! Isn't it amazing how little it takes to please them? Congratulations on your quilt! It is a beauty. I know your daughter will enjoy it for a long time. Odds are good that you'll now have to make another one. They are addictive :):):)! whooo, i LOVE your quilt !! Where did you get the dora panels? 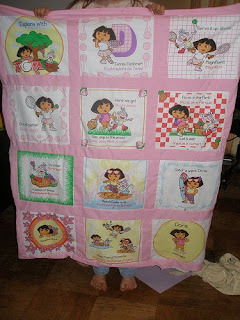 My 4 yr old daughter is in LOOOVE with Dora, and would love those panels.